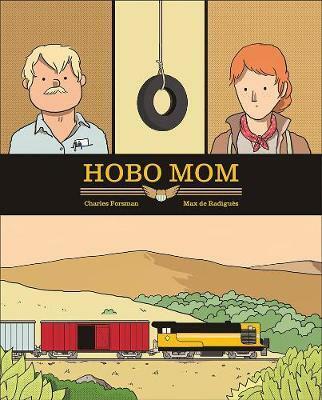 Hobo Mom is available now from Fantagraphics Books. By Zack Quaintance — Hobo Mom, which was released last month by Fantagraphics, is an interesting graphic novel in terms of its construction. Billed as “a cross-Atlantic collaboration” by marketing material, the book was drawn by two cartoonists simultaneously: Charles Forsman (The End of the F***ing World, which was recently adapted by Netflix) and Max de Radigues (Bastards, which won a prestigious prize at the Angoulême International Festival of Comics), a pair of as literary comics makers as we have today. In fact, de Radigues was recently featured in the seminal literary journal, The Paris Review. I’m not entirely clear on what the working relationship must have been like. Technology makes it so that collaborators—regardless of what bodies of water stand between them—can pretty seamlessly work together as if they’re in the same room. So, I assume the work was done digitally and it just went from there. What’s more interesting to me is that the book reads on its surface as if it were done by one artist. To my eye, at least. I read a lot of comics, and I couldn’t tell where Forsman’s work stopped and de Radigues’ began. My presumption is that the vast majority of readers will process this work that same way. The story itself is as literary and character-driven, as understated and as focused on the smallness of a normal life with normal pains as the hybrids of the artists’ backgrounds would suggest. There is, of course, a plot conceit that makes this story worthy of narrative, that being the titular Hobo Mom, who has left her daughter and the father of her daughter for a transient life in Northern California’s Marin County, a gorgeous coastal area rich with temperate weather and redwoods just north of San Francisco (I live in nearby Sacramento and go hiking in Marin several times a year). The plot involves the mother returning to the family, and the complicated and intense emotions such a return engenders. These emotions are all played out by the storytellers excellently, with subtle notes and quiet, well-illustrated visuals. The daughter does not know her mother, although we are given the impression that the bond between them is one easily rekindled, even if it’s never stated. The scenes between the two of them—the moments of tentative embrace, the strange appearance of a grown woman’s body in a home that has never had one—are among the most heartrending not only in this book but in all of comics so far this young year, up there with the likes of First Second’s excellent coming of age OGN, Bloom. Hobo Mom wisely avoids the reductive character pratfall of casting any of those involved as a clear villain. The easiest impulse for most will likely be to resent the feckless mom for her abandonment. Narratively, I think our culture is trained to always always always respect those who stay. We’ve just read and watched and even lived years of stories that suggest most situations can be salvaged if we put in the work. To be certain, there is a bit of that sentiment in this graphic novel. The father is not cast as abusive or even emotionally distant. He’s an almost-aggressively normal man, who spends his days working as a locksmith, eating lunch in his truck as he drives from home to home, dabbling loosely in the lives of others as he finds ways for them to let others in or cast their own irreconcilable situations out. The titular Hobo Mom prepares to see the pre-teen daughter who no longer remembers her. A key scene involves a brief conversation between the father and a woman for whom he changes the locks. In the course of his work, they strike up conversation—it’s a small town this story takes place in, wherein the residents seem well-known to each other—and she tells the father about her own marital discord. It’s an organic conversation, one that leaves readers with the vague notion that there doesn’t have to be blame for these sorts of deteriations, that family and children and forging a life are all messy business, that things must pivot, wall must go up. That when someone leaves, the previous status quo is not one that can ever be returned to. The central idea within this story has to do with perspective, with disparate notions of what constitutes happiness. The book is not interested in lecturing its readers about what they should want. Instead, it explores the tragic nature of humanity’s inherent disability to pinpoint what exactly is best for ourselves as well as those around us. There is never so much as a moment questioning intent. Even the father at his angriest seems to understand his partner’s condition, even if he’s not happy about it, and this to me is the greatest strength of Hobo Mom, the creative choice that makes it feel so authentic. It’s a poignant tale for a cultural time in which notions of family are evolving, certainly within our North American culture and I’d presume within Europe as well. The fact that these two cartoonists were able to collaborate on such a cogent story certainly speaks to that. In the end, Hobo Mom is a slow and aching story that ends on a hopeful, if uncertain note. I believe the role of the best fiction is to leave us with more questions than answers, and this book certainly does that. It’s a quick read, albeit one likely to linger in the minds of the audience for many months, especially with those of us who have ever considered whether total freedom—regardless of the cost—would be a happier state than our current daily responsibilities. Past TRADE RATING installments have focused on Green Lantern: Earth One, Sara, and The Unbelievable Andy Kaufman.